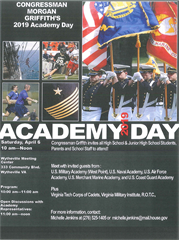 Click the image above to learn more about 2019 Academy Day. Thank you for your interest in the U.S. Service Academies. As your Ninth District Representative in the U.S. House of Representatives, each year I have the privilege of nominating a limited number of people to four of the five service academies. The honor of attending a service academy comes with an obligation and commitment to serve in the military for a minimum of five years upon graduation. For more information, please review my page of Frequently Asked Questions for those seeking a Military Academy Nomination. Best wishes to you as you pursue your goal of attending one of the U.S. Service Academies and serving our country. To request more information on Military Academy Nominations, please contact Michelle Jenkins at 276-525-1405 or by email at michelle.jenkins@mail.house.gov. Receiving an academy appointment is an extremely competitive process. Unfortunately, qualified candidates may not be selected to receive a nomination or appointment. However, many colleges and universities in the Ninth District and across the nation have ROTC programs located on their campus. ROTC can offer you the same officer commission and military career opportunity as a Service Academy. The links below will provide you with more information on each Service's ROTC program.